For a warm, friendly and pleasant stay in Gore, book with Esplanade Motels. Esplanade Motels in Gore offers cosy units with free internet, flat screen TVs with sky and complementary tea and coffee. There’s so much to see and do in Gore, from museums to world renowned trout fishing. Esplanade Motels offers free wireless internet, flat screen TV with Sky in each unit, wheelchair accessible units, BBQ and lots of parking, a courtesy car (by arrangement), laundry facilities, tea, coffee, fresh milk and biscuits provided, rooms serviced daily, and if you need any helpful and friendly advice, just ask your hosts; Jack and Gillian. We’re here to make your stay in Gore as delightful and comfortable as possible. We hope you have an enjoyable and memorable stay. Check availability now to secure your stay at Esplanade Motels, Gore. "Room was clean, comfortable, with extra heating, beds were soft, with heaps of blankets for warmth. Plus, electric blankets for those who wanted more. The owners are amazingly friendly and helpful. 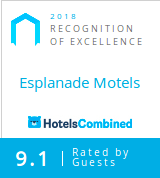 We would recommend Esplanade Motels to everyone." Sign up for news, events and specials from Esplanade Motels.